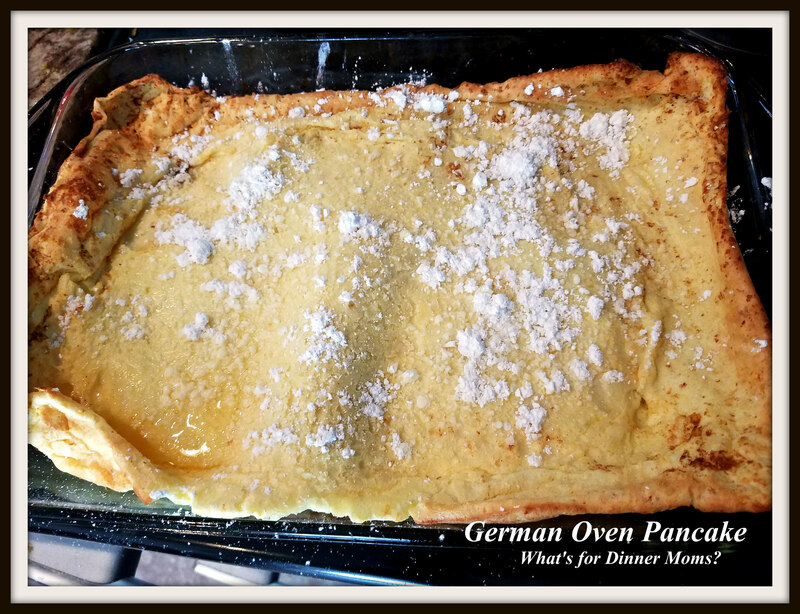 German Oven Pancake – What's for Dinner Moms? I did a bit of digging to find out what is the difference between a Dutch Baby and German Pancakes. This is more a hybrid between the two dishes. The Dutch Baby has the same basic ingredients as this dish but is to be prepared in a special pan. 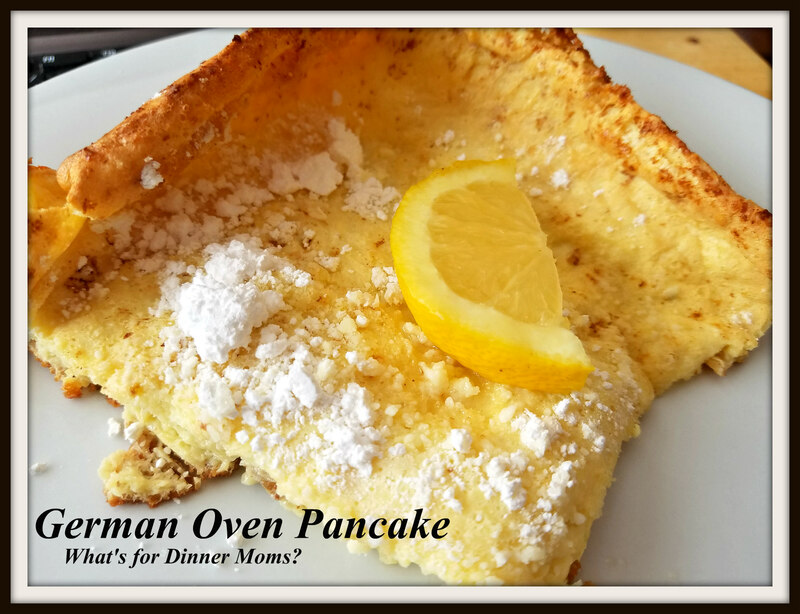 The German Pancake is similar but instead of putting fruit or juice on top you can mix it into the batter which also can have sugar in it and it is made in a large casserole pan. So, this I guess is really a Dutch-German Pancake. Whatever it is it is a simple breakfast or dinner! These are called pancakes but to me they are more like a simple custard dish. They don’t taste like pancakes but more a French Toast even though there is not bread over it. 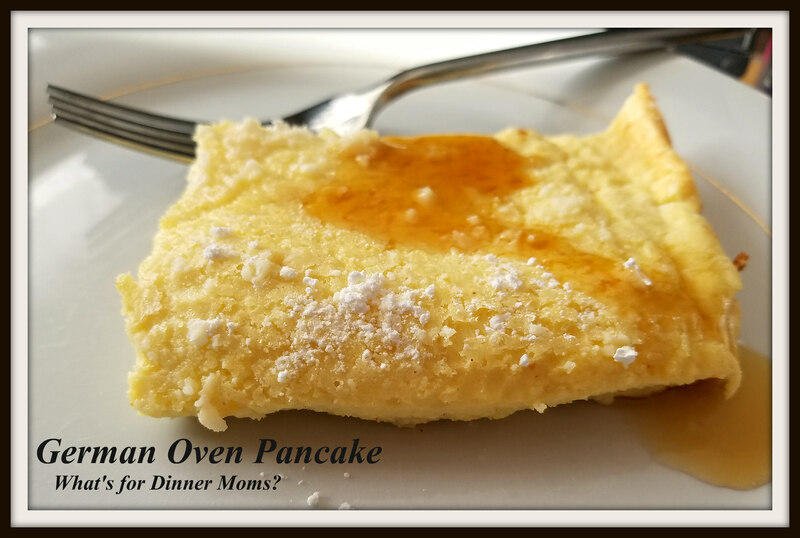 It is SUPER simple to make and can be a fun easy dinner or a great weekend breakfast. My family mostly prefers the fresh lemon and powdered sugar over the dish but maple syrup is delicious too! Note: When my kids were checking that the dish was done they were worried because the edges raised and the center was still sunken. This is the way it is supposed to look. I posted a picture at the bottom of this post so you can see it is done when it is well browned on top and the center is set. Preheat oven to 425 degrees. Place butter in a 13″ x 9″ pan and place the pan in the oven as it is preheating. In a large bowl or a blender mix eggs, milk, flour, salt, and vanilla until smooth. Remove pan with melted butter from oven and pour the batter into the pan. Return pan to oven for 20 minutes or until edges rise and are well browned. Remove pan from oven and sprinkle with powdered sugar and fresh lemon or powdered sugar and maple syrup. My German grandmother and of course my Mom made these and called them ‘shrovers” My kids loved them, but I am not sure they have passed them on to the grands. I’ll have to jar their memories! Thanks as usual for not only the recipe but the memory. Times coming up to make a few. Glad to stir up the memories. Looks wonderful! You say you can add fruit to the batter? Does it change the baking time at all? It may change it by a minute or two if you add berries 3-4 minutes if you add apples. Check to see if it is done by testing the center of the pancake. It should be slightly springy but not too soft. Hope that helps. There you go! It’s a sign. Hope you like it! This looks amazing! I’m going to give it a try this weekend perhaps. Hope you like it. It is simple and the flavor is in all what you top it with so pick your favorite! Hope you like it! My family’s German pancakes were what some call latkes. They were more savory than sweet. My grandmother and mother shred potatoes, and added onions and paprika. We ate them with sour cream or applesauce. I was always unsuccessful making them, but maybe I should try again! Love latkes! I haven’t had them in ages. Maybe it is time to make some again! Thanks. I often saw this dish on the menu of pancake restaurants but I never tried it. I think the first one I eat will be the one made from your recipe, Marci! Awe, thank you Erika. It has a spongy texture that I was not expecting, kind of like French toast without the bread. Thank you! That was the exact reason I made it. I want to show some with berries and apples sometime soon too. I used to make this also. So good and easy. Yes! Perfect for a brunch or easy dinner.